Congrats to “The King’s Speech” on winning the Best Picture. If you haven’t seen it, go watch it now. Great film. Boom. There it is- the number one video game of all-time. Even though this countdown has been put together on a personal basis, there isn’t a game that can compare to NHL 95. It’s probably the most simplistic game, but it’s the most entertaining game I’ve ever played. In order to play, you only need to know how to do three things – shoot, pass, and check. In order to score a goal, you don’t need any dangle skills or rip slap shots from the blue line. All you have to do is move close to the net, move the puck to the right of the goalie, then to the left and shoot. It fakes them out every time. Just like the NBA, I feel that the mid-90’s was the golden age of the NHL. Each team has a superstar and was in contention for the playoffs. (The only teams that sucked were the ’93 expansion teams). Some of the most fun teams to play with were the defunct franchises such as the Hartford Whalers, Quebec Nordiques, and the Winnipeg Jets. Actually, the Nordiques had a stud team featuring Joe Sakic, Peter Forsberg, and goalie Patrick Roy. My Islanders weren’t too shabby as well. Lead by NHL all-stars Pierre Turgeon and Ron Hextall, the Isles could take on anyone in the league. Plus, Isles’ forward Benoit Hogue was one of the fastest skaters in the game. Unfortunately, the Rangers were unbeatable in this version. Coming off their ’94 Stanley Cup, almost all of their starters are ranked over a 90 (Mark Messier, Brian Leetch, Adam Graves, Steve Larmer, and Mike Richter were all Eastern Conference All-Stars in the game). If you guys really know your hockey video game history, you’re probably wondering why I would chose NHL ’95 over NHL ’93. I know the ’93 version has fighting and has players’ heads bleed on the ice. 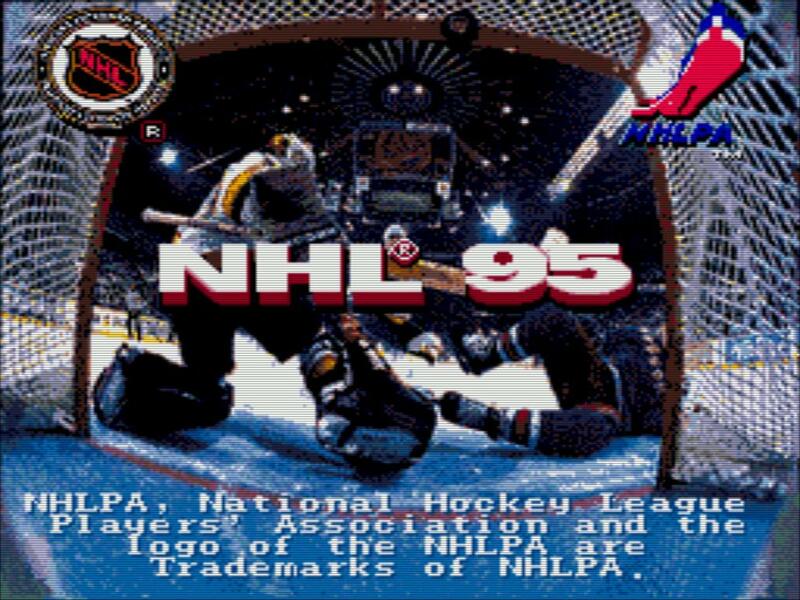 But on a personal note, NHL ’95 was the first video game I ever owned. Plus, I still play the game today. So from the age of eight to present day, this game has been played non-stop on my Super Nintendo. Don’t get me wrong, I love NHL ’93, but I have to go with my first owned video game. 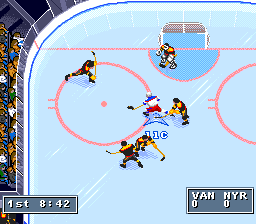 Plus, why is the ice blue in NHL ’93? At least in ’95 the ice is realistically white. Plus who can forget “Hava Nagila” playing before face-offs? Classic. So this concludes the top 10 sports video games countdown. Hope you guys enjoyed it. Stay updated for our next countdown – the top sports movies of all-time, which will be written by sammywestside. Couldn’t be more proud to be a Knicks fan tonight. When the Knicks traded for Carmelo, this is the performance I knew they were going to be capable of. In the first quarter, Miami steamrolled through this raw team. But with three minutes to go in the half, the Knicks shifted the momentum of the game and quite possibly the season. Now of course I have to give kudos to Carmelo and Amare for their outstanding play. If it wasn’t for Carmelo’s strong first quarter, the game would’ve been out of hand by halftime. Stoudemire gave us another great game with another double-double. His dunk in the first quarter made a statement that the Knicks are here to battle. And who can forget the block on LeBron with 12 seconds to go? Definitely the play of the game. But let’s talk about my man Chauncey Billups. Even though I thought highly of the guy, I had no idea he was going to be this much of a factor. His two steals in the final minute (against LeBron and Wade nonetheless) silenced the American Airlines Arena (with the exception of Spike and his crew). Then down by two with under a minute to go, he drains a pull-up three to take the lead. Felton was my boy, but I don’t remember any time he had this type of performance. Since when do the Knicks play defense? Definitely wasn’t expecting the Knicks to hold the Heat to 86 points. They practically beat them at their own game. The rebounding was still a little suspect, but luckily that this isn’t the Heat’s strong point either. I feel that the Knicks match up a lot better with Miami than a lot of other teams in the conference. Even though the Knicks played great tonight, I still feel they will struggle against Chicago. Boozer and Jo have the ability to dominate the boards against Turiaf or any other big man. The Knicks are making some great strides, but still must improve the front court if they want to go deep into April and May. 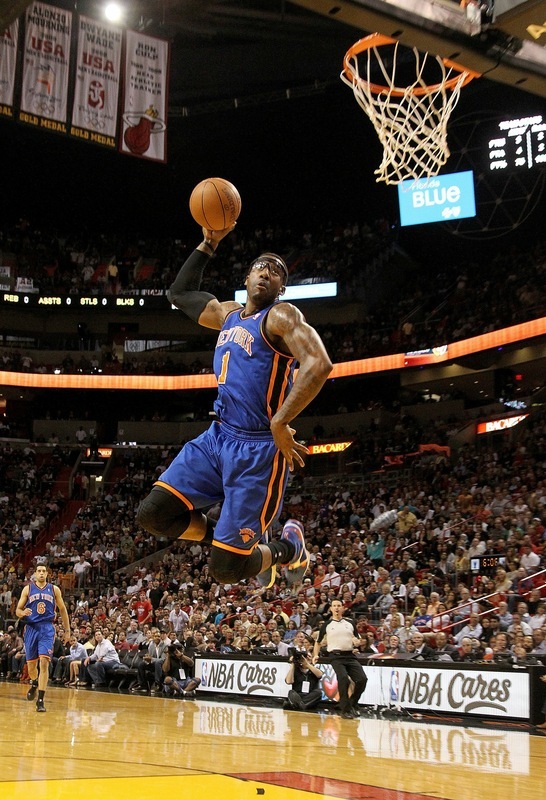 The Knickerbockers head to Orlando to take on the Magic Tuesday night. Since my updated Bubble Watch last night, there have only been a few games of note for Sunday. Xavier ended Dayton’s at-large hopes today with a victory at the Flyers home court. West Virginia avoided an upset at Rutgers, and UConn defeated Cincinnati. Michigan State got destroyed by Purdue at home, and continue to sit tenuously on the bubble but for now remain in for their quality wins. The Spartans are now 8-8 in conference are must win against Iowa this week, before their showdown in Michigan. The game next weekend might be more important for the Wolverines, but Michigan State won’t feel comfortable with a loss there unless less win a game or two in the tournament. Purdue remains a two seed with their strong showing today on the road. Louisville beat Pittsburgh and helped themselves out a bit. Pittsburgh remains a one-seed but barely. The Panthers will likely have to win out until the Big East tournament Semi’s or Finals if they want to hold on to it. Marquette continued playing well by beating Providence and should feel pretty comfortable right now despite the many losses they have. Maryland missed an opportunity to upset UNC in Chapel Hill and the Terps remain outside of the field as their chances to impress us with any good win is running out. Washington State got a big win tonight by upseting Washington on the road. The Cougars are now back in the race and with home games against USC and UCLA remaining, they have a chance to play themselves into the field. For now they remain a bit of a ways out, but they do have a decent chance because of the remaining schedule. 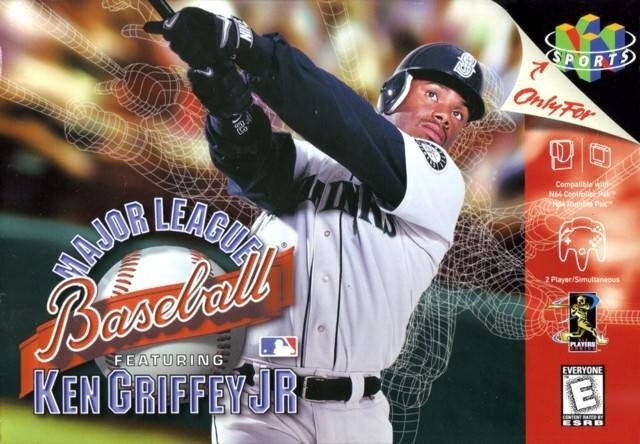 #2: Major League Baseball featuring Ken Griffey Jr.
Perhaps the most memorable line in video game history. This 1998 Nintendo 64 classic is the greatest baseball game of all-time…period. Like I’ve said before, the best sports games are the one’s with the arcade style of play. 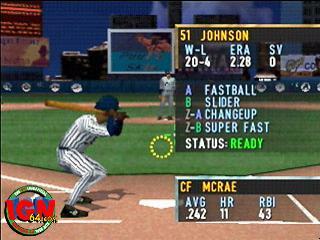 All-Star Baseball ’99 for N64, the game’s rival at the time, had much better graphics. But sometimes the games that are faster and less realistic are the ones that are more addicting. Just like our last two games on the countdown, the ballgames go by very fast. (Not as fast as NBA Jam and Blitz, but still fast enough). Also, everything in the game is exaggerated, which makes it even more fun to play. For example, Randy Johnson’s “Super Fastball” is consistently clocked at 106 mph in the game while Jamie Moyer’s “Super Change” is clocked at 46 mph. Plus, when you hit a homerun, the crack of the bat sounds like we’re in Hiroshima circa August 1945. And the best part of all, Derek Jeter is black. Ken Griffey Jr. Major League Baseball is also the first game to allow the user to have a home run derby. Up to four users can participate and one can choose any of the 700+ ballplayers for the derby. In the season mode, you can trade any players you want (the computer has to accept the deal). With the right trades, you can have the best team in the game. There are three types of hitters in this version – “small circles,” “medium circles” and “huge circles.” The small circle players are the ones who have a smallest hitter zones. The medium circles have an average size zone. Huge circles are the best in the game. When you stand up to the plate, you must locate the pitch and move the hitter’s circle to the right location. Then you must time the pitch to make contact. The bigger the circle, the easier it is to locate the pitch. There are only eight players who have huge circles – Ken Griffey Jr., Edgar Martinez, Frank Thomas, Paul Molitor, Larry Walker, Mike Piazza, Tony Gwynn, and Barry Bonds. Play the right cards and you can have all of them on one team in season mode. Pitching is a lot of fun in this game, only if you know how to pitch. If you serve up ball in the zone, you will get killed. The key is to start the pitch way out of the zone, then move the joystick to bring the pitch back in the strike zone. In my opinion, the most unhittable pitcher is Roger Clemens of the Toronto Blue Jays. His splitter would start above the umpire’s head, then suddenly move down to the outside corner on the black. The two pitchers I could never hit were Tim Wakefield and Steve Sparks. Their knuckleballs would float in the air at 53 mph and I could never locate it, no matter how big my circle was. If you’re in my generation and you’re a baseball fan, you know about the greatness of this game. Hope everyone’s ready for #1 tomorrow. St. John’s is the hottest team in America. Fact. On Saturday they went to #14 Villanova and came away with a convincing 81-68 victory. This now moves the Johnnies to 11-5, with two regular season games remaining against South Florida and Seton Hall. It is now a possibility the Johnnies finish 13-5 in the Big East, and 21-9 overall going into the Big East Tournament. They will likely get a double bye as a result and begin play in the quarter finals. No one wants to play them, nobody. This is a team that appears capable of winning anywhere in America right now and we’re all just sitting here in amazement waiting for them to come back down to earth. Little did we know when they beat Duke, it’d start this kind of tear, which is now 8 of 9 wins. If they can lock up the last two, the Johnnies could be one of the favorites to win the Big East tournament and secure a very seed in the NCAA tournament. Right now the Johnnies have moved up another seed line in my opinion. 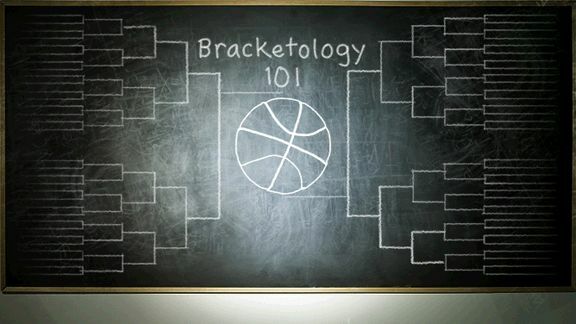 Come the next bracketlogy we’ll see them on the four line. While the Johnnies win was big for the Red Storm, it didn’t have a large national impact, particulary on the bubble. Today alot of games have taken place and teams are gaining ground and eliminating themselves all over.